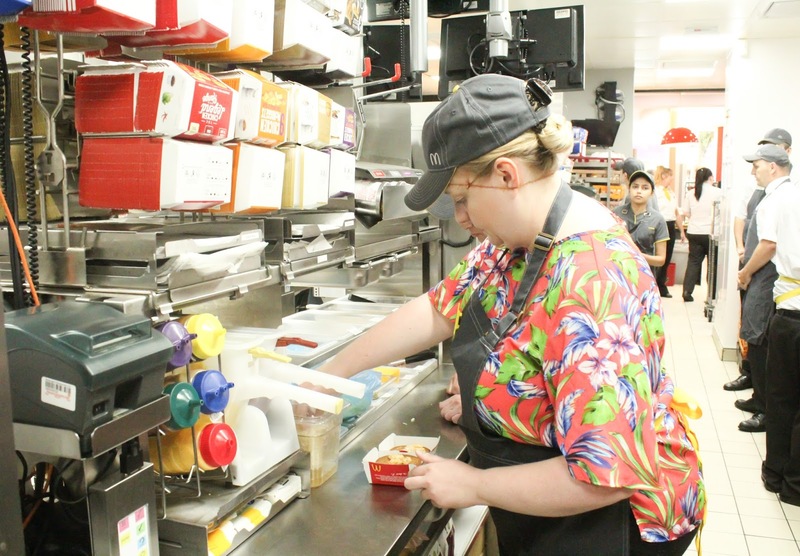 Behind The Scenes At McDonalds: What's It Really Like? 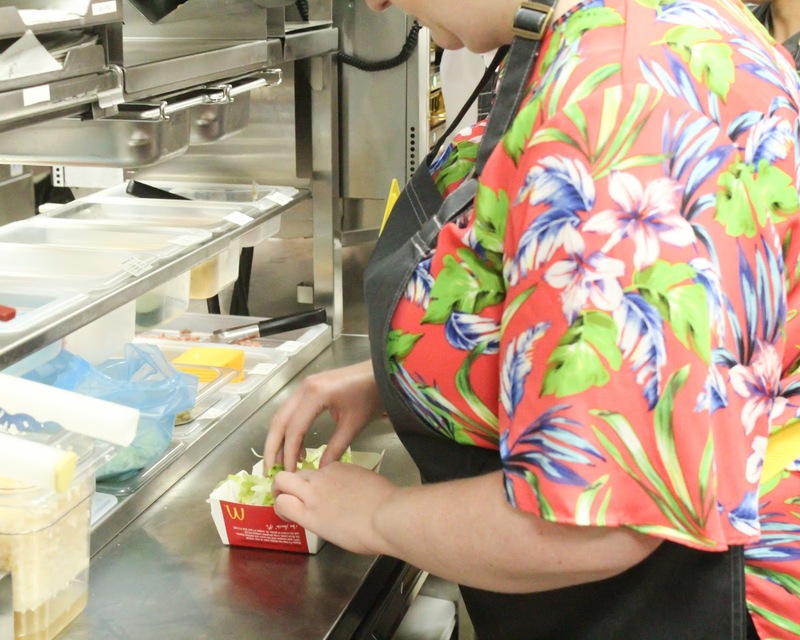 A few weeks ago, an opportunity popped into my inbox inviting me to go along to one of our local McDonalds stores to take a look at some of their innovative new features, as well offering me the chance to take a behind the scenes look at the kitchen and even try my hand at making my own burger. 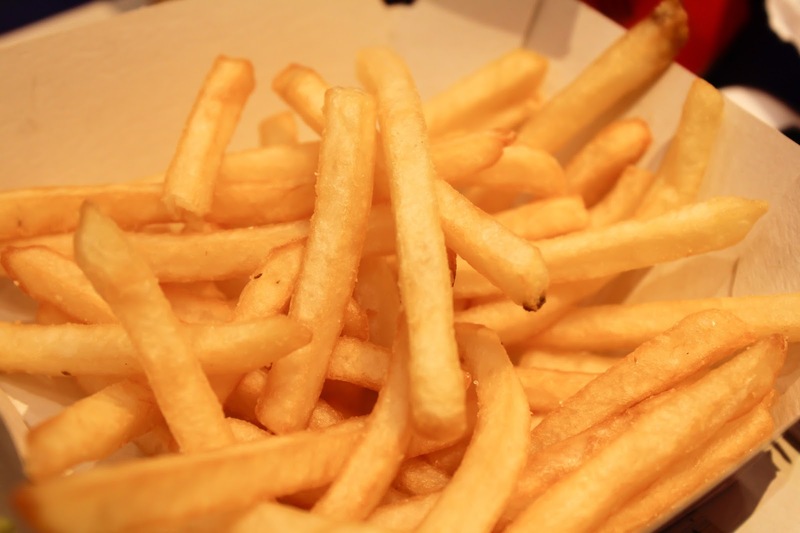 I was immediately sold on the idea as, to be honest, I knew that it would be a topic of interest to a lot of people - we've all all heard the urban myths about what goes into McDonalds food and I think we've all wondered about exactly how a fast food restaurant with such an extremely fast turnaround operates behind the scenes and whether it falls down on cleanliness given the high pressure environment. I practically bit their hand off to accept the invitation. It was only then that I started to notice some less than favourable remarks from other bloggers who had received the invite speaking of how they weren't keen to talk about something such as a fast food restaurant on a family blog - perhaps I'm out of touch but as a Mum of 3 children who are certainly fans of the occasional Happy Meal, I can't think of anything more fitting than a Mummy blogger going behind the scenes - if anybody is going to be keeping an eye out for dirty surfaces or poor hygiene it's a mother! And given the fact that my own children do eat at McDonalds, I want to see for myself that their standards are high. I'm not going to pretend for a moment that my response to a chaotic friday nights dinner dilemna is organic quinoa and hand blended hummus - it's a McNugget Happy Meal and a good old fashioned fruit shoot! I'm a firm believer in the "Everything in moderation" approach - there's nothing wrong with an occasional treat. And so, off I went to take my behind-the-scenes peek - I attended along with a couple of other bloggers and we were introduced to some of the McDonalds team, led by Dave - the Franchisee of the Plymouth New George Street branch we were visiting. Dave filled us all in on his career with McDonalds which had begun 34 years ago at the age of 17 when he got a job in his local branch in food service - throughout the years he worked his way up the ladder all the way to corporate, before eventually becoming the owner of a number of franchises. It's common to think of a McDonalds employee as a teenager who will only stick with the job for a few terms at uni but actually from speaking to the staff it seems that McDonalds offers the possibility of life long career with lots of opportunity for progression, and they certainly seem to treat their employees well with regular reward schemes and staff incentive programmes. After our chat, we were taken for a look at the new ordering kiosks which have pride of place in the Plymouth New George Street branch - these are large touch screens which allow you to select your meals at the touch of a button - giving you the option to customise your burgers to your taste, change your side orders and see the calorie content of each item before purchasing too. The order screens come with the option for ease of reach for disabled customers or children who want to order for themselves, and also have a number of language options available too. One of my favourite things about the order screen was that it gives you more chance to browse the menu and find items you might not have been aware of - for example, until using it I had no idea that McDonalds offered bottles of milk as a drink option for children. I also didn't realise you could swap your french fries for a side salad either...handy to know! It was very handy that the Happy Meal screen allowed you to select a Plain cheeseburger or hamburger at the touch of a button too - my kids always ask for their cheeseburgers without ketchup or pickles, so this would make the ordering process much more straightforward! 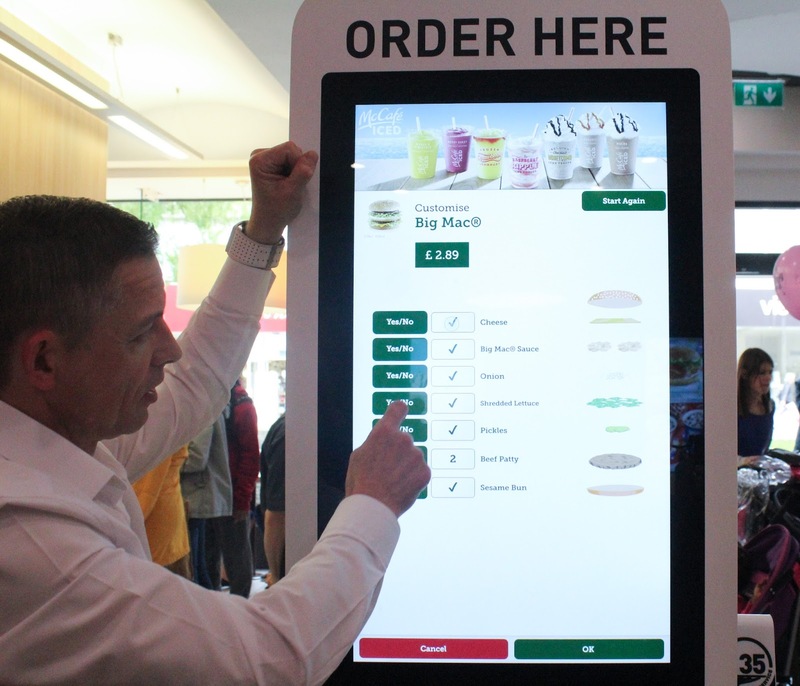 Another new feature, one which I think is a really fantastic idea, is that the order kiosks at this branch give you the option of table service too - all you do is take a table number, enter it with your order and take it with you to your table. The number placard is tracked which means that the McDonalds staff can find you no matter where you are in the restaurant and bring your order to you...how clever is that?! SUCH a handy service for families with multiple children or those with mobility issues who may struggle to carry their own trays to their tables. Another new addition was the presence of tablets at some of the tables, giving customers the opportunity to browse the web or keep up with social media while enjoying their food - the tablets were even loaded with games for children which I thought was a really good idea particularly for teenagers. 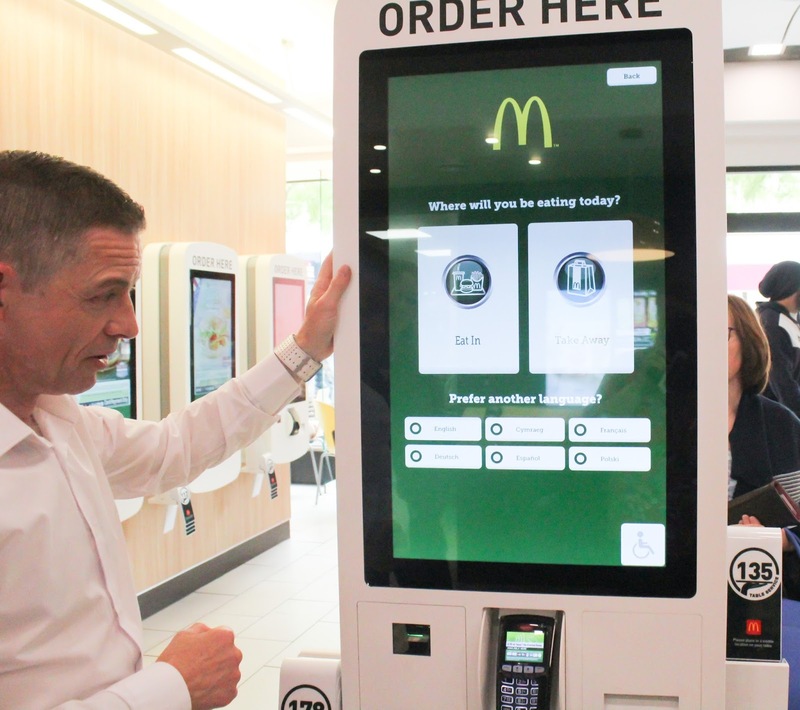 I have to say, the visit left me feeling thoroughly impressed with how much effort McDonalds makes to move with the times and incorporate the use of technology in its evolution - I personally think this is what really sets it apart from its competitors. After seeing the new order stations, it was time for the main event - the kitchen tour! 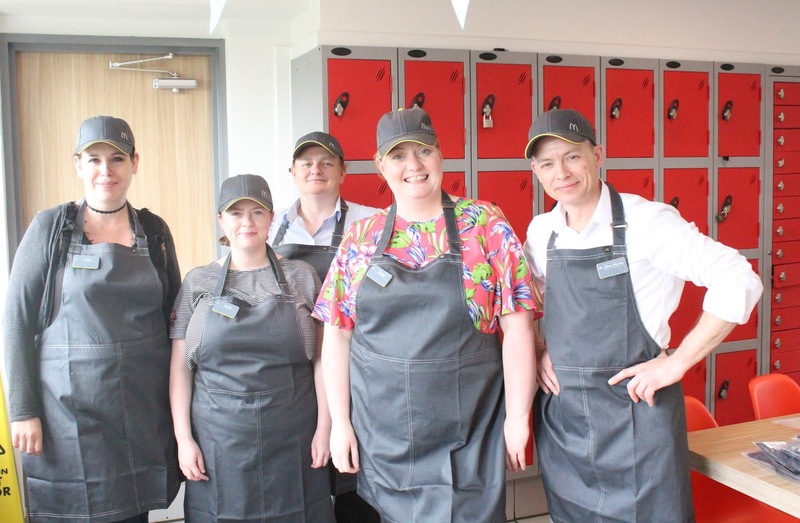 We were taken to get into our aprons, hairnets and hats then off we went into the kitchen - I was honestly amazed at how efficient everything was. There are so many staff members in a relatively small space but everyone seemed to know exactly what they were doing - there was no chaotic feel about it at all, it was like a well oiled machine with orders flying out as fast as they were coming in. What surprised me most was that every single menu item other than fries and drinks was produced on two lines - a member of staff at the very end watches the orders comes in on a computer screen, and starts the process off by preparing the bun or wrap and placing the order sticker onto the relevant box - it's then passed along to the next person who "dresses" the item - putting on the required sauces, salad items, cheeses, etc - and then the meat/filling is put in last, and the item is wrapped and sent down the shute to the front of the store where another member of staff is waiting to pop it into the bag for the waiting customer. 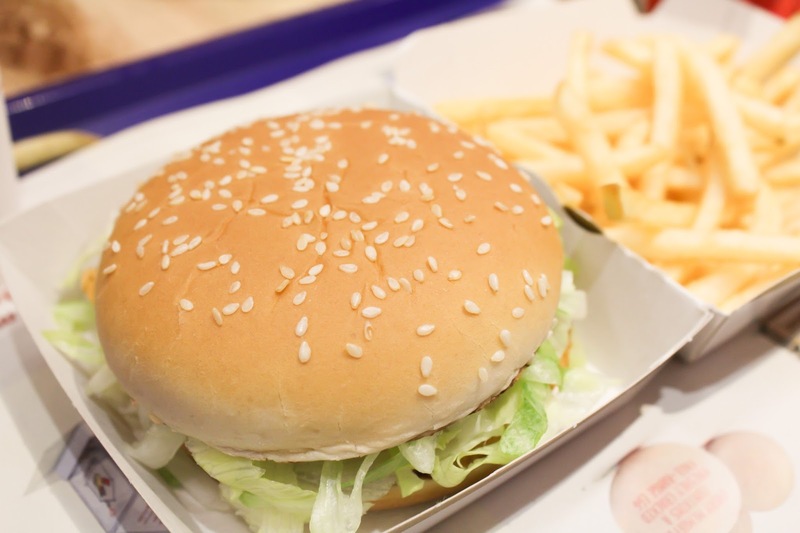 I remember a time when McDonalds would pre-prepare their burgers and have tons of them waiting to be ordered, but in this branch everything is made fresh to order and they aim to deliver each item to the customer within an astounding 45 seconds of it being prepared. 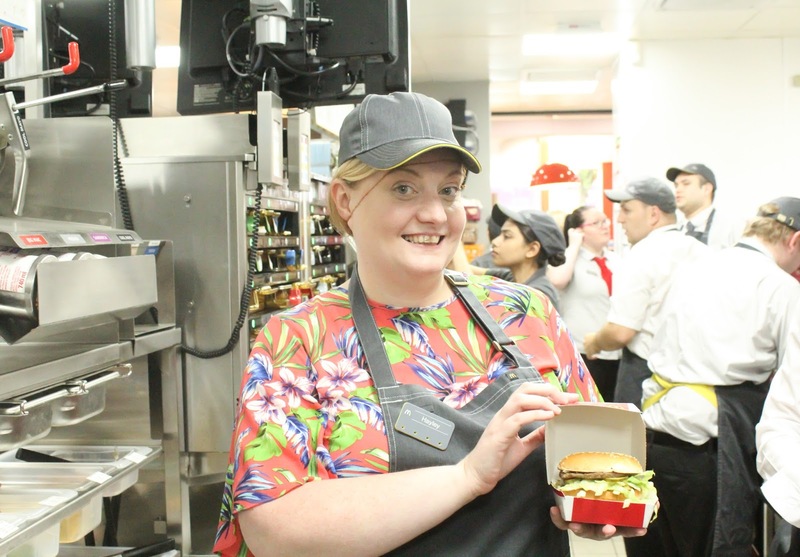 After the tour, we were given the chance to try our hands at making our own Big Mac - you'll have to take a look at the video below to see how I got on, and for your own glimpse behind the scenes of a McDonalds kitchen! We were then treated to lunch which, after seeing for ourselves how clean the kitchen was and how fresh the ingredients, we were more than happy to tuck into! A huge thank you to Dave & the team at Plymouth New George Street McDonalds for an informative and enjoyable afternoon - I was thoroughly impressed with what I saw, and I won't be stopping those Happy Meal treats any time soon. *This is a collaborative post, however all words and opinions are my own.